"Day One Adventurer's Edition" announced. Ys VIII: Lacrimosa of Dana will launch for Switch on June 26 in Noth America and June 29 in Europe, publisher NIS America announced. In Japan, a release date of June 28 was previously announced. The Switch version of the game includes the content from both the PlayStation 4 and PS Vita versions. 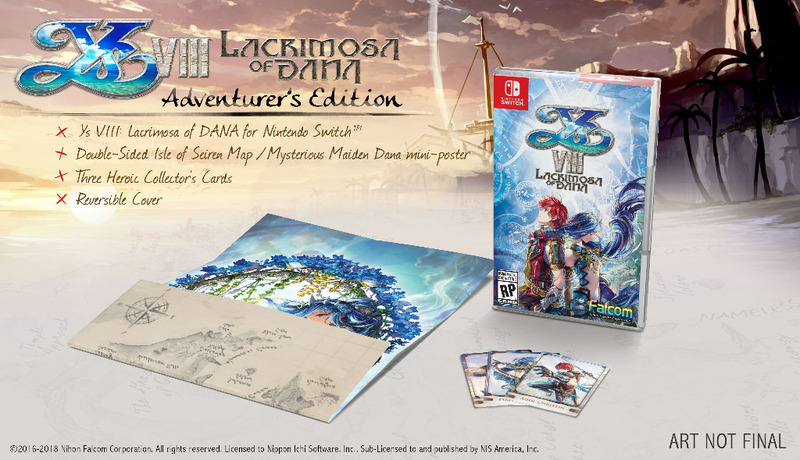 A “Day One Adventurer’s Edition” will include a reversible cover, an exclusive foil pack of three character cards featuring Adol, Dana, and Dogi, as well as a double-sided poster featuring Dana and the Map of the Isle of Seiren.